This ATC/ATO fuse kit provides a convenient and economical way to protect your circuits. The kit is small enough for easy handling and contains an assortment of ATC/ATO and MINI fuses ranging from 5A to 30A and tap-ins inside a convenient carrying case (4-1/2"x2-5/8"x1-5/16"). Our fuse kits offer an excellent combination of fuses so you are always prepared. These fuses are a convenient and inexpensive way to protect your circuits. 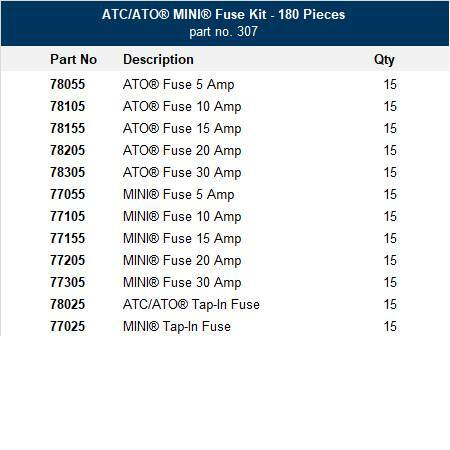 This kit contains an assortment of 75 ATO/ATC fuses ranging from 5A to 30A, 75 MINI fuses ranging from 5A to 30A.